Beautiful decorating of this luxury apartment presents unique, creatively customized modern designer home that is on sale for $5.2 million dollars. Spacious apartment ideas are combined with unusual and very decorative accents. Surprising interior design mix elegant finishes and luxurious materials, creating inviting and stylish rooms. Brick wall and wood floors, antique furniture and contemporary materials, retro style home decorating ideas and contemporary spaciousness create an impressive home interiors that feel energetic and cheerful, and look warm and welcoming. 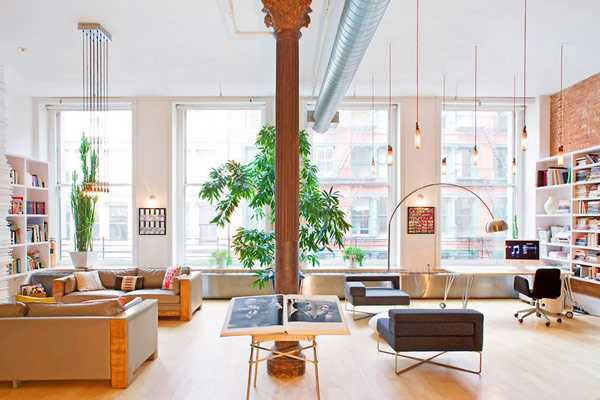 The Apartment Creative Agency completed an amazing living space conversion of a large apartment in Soho, New York. This apartment is located on coveted, cobblestone Crosby St, famous from the film Devil Wears Prada, where it was filmed as the cinematic expression of a modern designer home. This unique home boasts gorgeous 13 foot ceilings, impressive Corinthian columns, unique sculptural stacked-wood fireplace, Marc Sadler Boffi kitchen, Crestron controlled multi media system, plus great light and views. The apartment is located in 1882, six-story, red brick building with an intriguing past as a department store. The discreet building provides a well appointed lobby, key lock elevators and part time doorman. The apartment is currently available for sale or rent ($19,500). Colorful and bright, stylish and unique, this apartment staging design offers a great retreat in a busy city that impress, invite and delight with stylish and pleasant home decorating ideas.